Ever stop to think how amazing our bodies are? Deepak Chopra points out that "skin replaces itself once a month, the stomach lining every five days, the liver every six weeks, and the skeleton every three months." The body is constantly renewing itself. It sheds the old to make way for the new. Struggling with a negative body image does not allow us to give our bodies the gratitude it deserves. Polluting it with unhealthy substances over time breaks down the body's performance. Neglecting its needs is self-abuse, not self-love. Let us reject the negative images of the body and bless it, for as we bless our bodies, they will bless us in return. Let us honor our bodies for the temples that they are. that I may conceive of my own power. that I may give sustenance to those I love. that I may bend so as not to break. that I may walk in the path of my highest will. 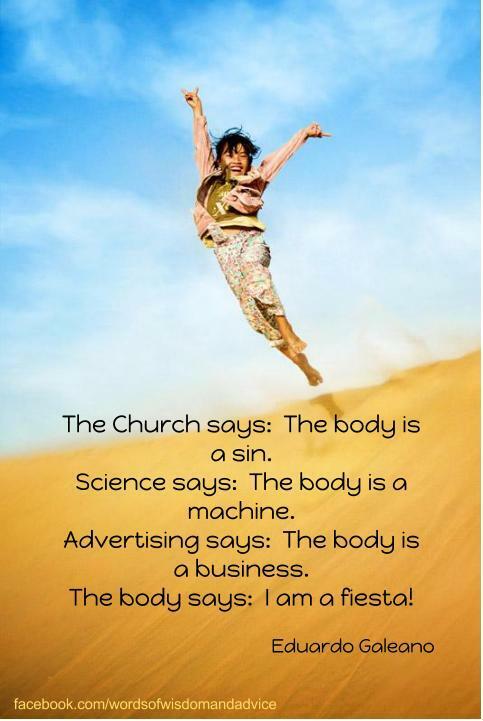 How do you honor and bless your body? Your comments are always welcome. (Excerpt from "The Network of the Imaginary Mother" from Upstairs in the Garden: Poems Selected and New, 1968-88 by Robin Morgan). Beautiful post Penny and what a beautiful poem by Robin Morgan. When I think about the complexity of my own body, the mysterious functions that support my very existence I feel a direct relationship to the sacred and to the spirit! Hi Gena! Yes, the body is so complex and mysterious. I'm always amazed at what it does to heal itself. I truly do see it as a temple for the sacred. When I was a personal trainer helping others to sculpt their own bodies, I enjoyed seeing people transform themselves both outside and inside. It's a beautiful thing! With nutrition & exercise. I had to put on my workout clothes because I just wasn't feeling it! ;-) Now there's no reason not to do some yoga today. Your post is making me want to express some gratitude & love to my body, which may fall over from shock of kind words. Thanks! I needed this. Kelly, I'm glad I could motivate you!